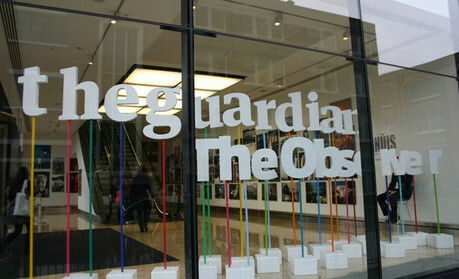 The Guardian is reorganising parts of its newsroom to better serve its digital audience. Visual journalism, data journalism and audience development teams will all be restructured after new executive editor for digital, Aron Pilhofer, spent the summer visiting other media organisations for inspiration. "I had a unique opportunity to spend time looking at different models and seeing how other newsrooms and native digital startups are doing this," Pilhofer, who joined the Guardian's UK office in September, told Journalism.co.uk. The new Guardian Visuals team will bring together the "raw materials of visual journalism", Pilhofer said, combining the graphics desk, picture desk, interactive team and parts of the digital design and multimedia teams. Citing his summer visit to National Public Radio (NPR) as a particularly strong influence, Pilhofer hopes the organisation of the new team will "break down the barriers" that may currently limit some projects. "The problem when you have these kind of silos is that it's hard to assemble teams that are cross-disciplinary," he said, "and have the right combination of designers, developers, graphic artists, photographers." The team of editors will be lead by an as-yet-unappointed editor of Guardian Visuals who will co-ordinate how certain stories are told and assemble teams around big events. The different desks will remain "semi-autonomous" but will eventually move closer together physically, with the intention of fostering "those accidental conversations that can only happen when you're sitting next to somebody", he said, "and we want to create a space for that to happen". While the Guardian's Data Blog has won awards for its work, Pilhofer wants to build a "more formalised desk" of specialists to collaborate with the rest of the newsroom on stories and projects. "They're meant to be a force multiplier for the newsroom," he said, "and provide a foundation for doing these kind of deep, data-driven news stories that we wanted to do." This will include larger investigations, but also any story that could have a data element and the data team will raise awareness in the newsroom about how this may be possible. Helena Bengtsson, currently at Swedish broadcaster SVT, will soon be joining the Guardian and new data editor Alberto Nardelli in guiding the wider newsroom in using more data. "Training has been incredibly impactful in the US to spread data journalism," said Pilhofer, "there's hardly a newsroom in the US that doesn't have a specialist in this area, and training is a huge reason for that. "So it's about giving people the ability to do their own work, the ability to explore and get excited about doing this. And give them the support, direction and encouragement they need." In a newsroom like the Guardian, such training is a "no-brainer", Pilhofer said, and the data blog itself will be expanded further. "Alberto and James [Ball, special projects editor] both have big, big ideas about what the data blog can be and how we can take it forward," he said, "and Helena will be a big part of that." The Guardian's in-house analytics platform Ophan is "a gift" in terms of understanding the audience, said Pilhofer, and has helped the reporters and editors to become comfortable with thinking about audience data and analytics in their work. A new editor for audience development will take this further, he said, both in terms of what data is analysed and how that is used throughout the organisation. "What I want to get past is a reliance on the metrics that work well with advertisers but not necessarily for content," he said, citing Medium and Upworthy as inspirations in how they look at their audience. "We want to get to the point where we're looking at the right numbers and behaviours that we think are valuable." Elements like total reading time and other "meta-metrics that tell you how the audience is behaving" will be explored by a team of analysts to help the newsrooms make "better decisions around their content". When asked whether this kind of restructure was uniquely applicable at the Guardian, or whether it should be an approach all news organisations should try to take, Pilhofer answered "emphatically and enthusiastically the latter". "It helps the newsroom," he said, "it brings some parts of the newsroom that were more attached to the traditional, into the new." As an example of how this may work in practice, Pilhofer spoke of a recent digital project spearheaded by the photo desk at NPR. The day before launch, he noticed a photo editor working with a developer "in the command line", the base level of code for digital projects. "That is how you move a newsroom forward," he said. "You provide a path. "You say to incredibly smart and creative people, 'here, you're now part of this and you have the ability to do things that you've only imagined'. "Now you have an incentive. Now you have a path forward." Pilhofer joined the Guardian from the New York Times, where he was part of numerous Pulitzer prize-winning teams. As editor of interactive news at the Times he commissioned Snow Fall, considered a landmark in digital journalism. Pilhofer will give the keynote speech at Journalism.co.uk's news:rewired conference in February. Find out more here.